U.S. Patent D056449 (PDF). Design patent for toys (D21/813) which was filed May 26, 1920. Issued Oct 26, 1920. Patentee was Clifford H. McGlasson. "Talking boards" came into existence during the late 1800s, when séances were at the height of their popularity. The Ouija board (pronounced 'wee-ja'), while not the original talking board, was the first talking board to receive a patent and the first to be commercially marketed. Though "Ouija" is a trademark name, the term is often used generically to describe any talking board. The board consists mainly of numbers and letters. Participants place their fingers on a "planchette," or small, heart-shaped piece of wood, which then moves around the board to spell out messages. Users of Ouija boards generally believe that the spirits of the dead exist in a "spiritual world" or afterlife, and can be contacted through the Ouija board in a similar fashion to a medium producing automatic writing. A variety of outcomes have been reported. Skeptics have accused users of fraud and misrepresenting the messages received by this method. Some users have experienced disturbing messages, while others have produced valuable information about which, by all accounts, they had no previous knowledge or was not accessible by their conscious minds. As with automatic writing, advances in our understanding of the unconscious and the spiritual world are needed to ascertain the value of the Ouija board and whether it can make a positive contribution to enhancing our world. It is often claimed that the Ouija has roots in ancient divination methods and oracles, or necromancy. According to Stoker Hunt's Ouija the Most Dangerous Game (1985), one of the first uses of "Ouija-like instruments" is found in China, centuries before the birth of Confucius (circa 550 B.C.E.). In reality, Fu Chi (also called Fuji, Fuluan, or Jiangbi), a well-known form of Chinese spirit writing, is simply automatic writing, with no board, letters, or message indicator. Aside from its purpose of contacting the spirits of the dead, there is nothing particularly Ouija-like about Fu Chi. Another often quoted statement taken from Lewis Spence's Encyclopedia of Occultism (1920) states that the Ouija board "...is very old. It was in use in the days of Pythagoras, about 540 B.C.E. According to a French historical account of the philosopher's life, his sect held frequent séances or circles at which ‘a mystic table, moving on wheels, moved towards signs, which the philosopher and his pupil, Philolaus, interpreted to the audience as being revelations supposedly from the unseen world." Critics of this claim point out that there is no record of any such French historical account, that this description is the first and only account of such a talking board in historic record, and that Spence also made the dubious claim that the planchette was invented by a French spiritualist named "M. Planchette" (a fact that would be highly coincidental given that "planchette" means "little board," not to mention the fact that there is no record of any person named "Planchette".) Additionally, the claim of ancient Greek use is called into question through historical accuracy, as Philolaus was born roughly twenty-five years after Pythagoras's death. While the ancient world certainly possessed various oracles and techniques for divination, there is no evidence that the Ouija board was developed prior to the nineteenth century. Before talking boards came into use, spiritualist mediums would use various methods to contact the spiritual world. Raps on tables, table tilting, and spirit or automatic writing were all commonly used by mediums. In the early phases of automatic writing, a pencil was attached to a small basket, which would theoretically be controlled by a spirit to write a message. Later, the basket was replaced by the heart-shaped planchette; a small wooden board with two casters and a pencil attached. However, all of these methods were somewhat frustrating; raps and table tilting were tedious and time consuming for even the shortest message, and automatic writing was often difficult to read. Some mediums gave up on the planchette and simply held the pencil in their hand, writing messages while in a trance state. Others devised complicated apparatuses involving moving needles and letter wheels, called "dial plate instruments" or "psychographs." The first talking board came into being around 1886, when reports of "do it yourself" boards circulated through the Midwestern United States. 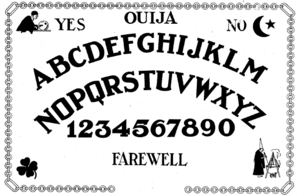 The first patent for such a "talking board" was granted on February 10, 1891, listing businessman Elijah Bond as inventor of the new "Ouija board," and Charles Kennard and William Maupin as assignees. As the legend goes, Bond named the board "Ouija" during a session where the board told him that "Ouija" was the Egyptian word for "good luck" (which it is not). It is also possible that Bond adapted the name of the fabled Moroccan city "Ouijda," particularly in light of the psychic popularity of the Middle East at the time. Kennard and partners then created the Kennard Novelty Company, and began production of the first commercial line of Ouija boards. The Kennard Novelty Company employed a young man named William Fuld as shop manager, and he erroneously came to be known as the inventor of the Ouija board. Kennard's financial backers withdrew their support and placed Fuld in charge of the company. Fuld, a natural salesman, was responsible for record numbers of Ouija board sales. He reinvented the board's history, claiming himself as inventor, and saying that he took "Ouija" from the French and German words for yes (oui and ja.) Reporters were told that the Ouija board gave Fuld all his most successful ideas. Due to Fuld's excellent marketing skills, Ouija boards outsold all competitors' talking boards. In 1927, Fuld died from a fall from his factory roof. While it is most likely that the fall was accidental when Fuld leaned on an unstable railing while supervising the installation of a flagpole, darker versions of the story involve demons, a tormented Fuld, and a tragic suicidal leap from the roof. The rumors surrounding his death only served to boost Ouija sales. In 1966, the rights to the Ouija board were sold to Parker Brothers, who, during the following year, sold over two million boards. The Ouija board outsold Monopoly, Parker Brothers' previously bestselling game, and though its popularity has declined, it’s still sold today. Aside from the belief that it is all a hoax, there are two main schools of thought on how the Ouija board operates. Many believe that the board serves as an aid to contacting a spiritual or supernatural realm. Others believe that it is a way to get in touch with one's own subconscious. Spiritualists believe that the Ouija board allows them to make contact with the spirits of the dead. By channeling, the spirit is able to control the user's body enough to move the planchette and spell out a message. Critics like the skeptic and magician, James Randi, have pointed out that when blindfolded, Ouija board operators are unable to produce intelligible messages. Supporters of the Ouija's spiritual abilities claim that the board has no intrinsic power in and of itself, but rather, is used simply as a tool to aid a medium while in communication with the spiritual world. According to spiritualists, the blindfolding of a medium places too great a handicap on the exercise, as the contacted spirits actually utilize the eyes of the medium during a Ouija session to point to the words and letters needed to form a message. Others believe that the Ouija board is merely a method of contacting one's own subconscious. "Ideomotor action," a term coined by William Carpenter in 1852, refers to the idea that suggestion or expectation can create involuntary and unconscious motor behavior, or muscular movement. The ideomotor effect has been used to explain dowsing, the actions of the Ouija board, and other seemingly "supernatural" occurrences. The ideomotor effect can occur in individuals as well as in groups, where it is referred to as a "collective" action. Sometimes called the "Automatism Theory," the idea that the Ouija board or automatic writing can provide quick access to the subconscious has some popularity as a therapeutic tool. The technique to use the Ouija board for therapeutic insight into the subconscious is similar to the technique used for contacting a spirit. The main difference is that the user, operating the board alone, addresses his/her own subconscious as though it were a separate entity instead of calling a certain spirit or asking if "anyone is there." Proponents of Ouija therapy also claim the technique works well for couples therapy, as it cuts through barriers erected to avoid conflict and helps the couple better understand each other. Although Ouija boards are viewed by some to be a simple toy, there are many people who believe they can be harmful, even dangerous. Those opposed to the use of Ouija boards claim that the board facilitates contact with evil spirits or demons, who masquerade as cooperative ghosts or dead loved ones, then proceed to trick players into becoming spiritually possessed. Others claim that evil spirits or demons can cause a user to start using the Ouija board as though it were a drug, eventually ignoring personal relationships and obligations. The use of a Ouija board has also been claimed to cause users to go insane. As early as 1924, Harry Houdini wrote that five people from Carrito, California were driven insane by using a board. That same year, Carl Wickland reported that "the serious problem of alienation and mental derangement attending ignorant psychic experiments was first brought to my attention by cases of several persons whose seemingly harmless experiences with automatic writing and the Ouija board resulted in such wild insanity that commitment to asylums was necessitated." In 1944, occultist Manly P. Hall, the founder of the Philosophical Research Society and an authority on the occult during the early twentieth century, stated in Horizon magazine that, "during the last 20-25 years I have had considerable personal experience with persons who have complicated their lives through dabbling with the Ouija board. Out of every hundred such cases, at least 95 are worse off for the experience." He went on to say that, "I know of broken homes, estranged families, and even suicides that can be traced directly to this source." Ouija board users have reported experiences of depression, hearing voices, and seeing apparitions after using the Ouija board. Suicides, and occasional murders are sometimes attributed to Ouija board use. Psychic Susy Smith claimed in her 1971 autobiography, "Confessions of a Psychic," that use of a Ouija board caused her to become mentally disturbed. Most Christians are against the use of Ouija boards, mainly because the Bible forbids all forms of divination. Most Christians also believe that no dead person's soul can be summoned, and therefore all spirits contacted through the Ouija board are demons trying to harm humans. The late Roman Catholic priest Malachi Martin believed talking boards were dangerous and claimed that by using these devices a person opens themselves to demonic oppression or possession, topics upon which Martin spoke and wrote extensively for many years. Spiritualists often use protective rituals before using the Ouija board, in order to lower the risk of attracting "low level entities." Visualization, the use of incense, and a call to spirit guides are all common methods of protection. Many spiritualists believe that "like attracts like"—those that use the Ouija board while intoxicated or those that possess a great deal of negativity will attract similar, low level spirits from the other side, increasing the risk of negative experiences. Whether one believes that the Ouija contacts spirits or is merely a vehicle to probe one's own subconscious, there are psychological risks to using the board. During Ouija sessions, it is common to receive vulgar or vile messages, as well as messages that tap into the users' fear of death. These messages can be highly disturbing to some, no matter what their source, and have the potential to exacerbate any existing mental disturbances. It is well advised that those with emotional or psychological disturbances refrain from the use of the Ouija. Talking boards have become an iconic part of popular culture, demonstrated by their appearances in many books and movies. Their roles in such vary from benign objects to evil entities. A more peculiar role of talking boards in literature stems from authors using the board to channel complete written works from the deceased. In the early 1900s, St. Louis housewife Pearl Curran used her Ouija board communications with a spirit named Patience Worth to publish a number of poems and prose writings. Pearl claimed that all of the writings came to her through séances, which she allowed the public to attend. In 1917, Emily G. Hutchings, a friend of Pearl Curran, believed she had communicated with and written a book, entitled Jap Herron, dictated by Mark Twain from her Ouija board. Twain's living descendants went to court to halt publication of the book. The literary community universally condemned the book as an invention and a poorly written one at that: "If this is the best that 'Mark Twain' can do by reaching across the barrier, the army of admirers that his works have won for him will all hope that he will hereafter respect that boundary." Since the 1970s, author Jane Roberts has transcribed text channeled from what she described as an "energy personality essence" named Seth. Topics attributed to Seth discuss the nature of physical reality, the origins of the universe, the theory of evolution, the many-worlds interpretation, the Christ story, and the purpose of life, among other subjects, and form a collection of more than ten books and a number of videos and audio recordings. Pulitzer Prize winning poet James Merrill used a Ouija board and recorded what he claimed were messages from a number of deceased persons. He combined these messages with his own poetry in The Changing Light at Sandover (1982). The Ouija has been a part of popular culture since its introduction. Representative of our fascination with the unknown, the Ouija board has been a presence in many homes, amateur séances, and slumber parties, and is often found in literature, film, and television. In particular, the occult side of the Ouija board is popular in the horror genre. In the classic horror film The Exorcist, a young girl uses a Ouija board and contacts a demon, who soon possesses her. The plot of The Exorcist is loosely based on the life of a Maryland boy around 1950 and his experiences with possession and exorcism after his use of a Ouija board. The Witchboard trilogy of horror movies also have plots centered around Ouija board use and possession. The Ouija board has made appearances in various television series, including Charmed, Futurama, and Supernatural, among others. There have been many notable users of the Ouija board. The famous occultist Aleister Crowley advocated the use of Ouija boards, which played a major role in many of his magical workings. Italian Prime Minister Romano Prodi held a séance in 1978 with other professors at the University of Bologna during which the board was asked the location of a prominent politician kidnapped by terrorists. The Ouija board, as the story goes, spelled out the word "Gradoli." Searches for the missing politician were made, but to no avail. It was only after the murder of the kidnapped politician that it was discovered he had been kept prisoner in a nearby suburb, on a street named "Via Gradoli". In a happier Ouija-related story, California resident Iris Maloney credits the Ouija for providing her with lottery numbers that won her and her husband 1.4 million dollars. ↑ "Ancient Ouija Boards: Fact or Fiction?" The Museum of Talking Boards. Retrieved March 15, 2007. ↑ 2.0 2.1 "History of the Talking Board" The Museum of Talking Boards. Retrieved March 15, 2007. ↑ "The Ouija and Talking Boards" Haunted Bay. Retrieved March 19, 2007. ↑ "Ouija board" An Encyclopedia of Claims, Frauds, and Hoaxes of the Occult and Supernatural (St. Martin's Press. 1995). Retrieved on March 20, 2007. ↑ "Automatism Versus Spiritualist: Theories of Ouija" The Museum of Talking Boards. Retrieved March 20, 2007. ↑ Robert Carroll, "Ideomotor Effect" The Skeptic's Dictionary. (November 28, 2006). Retrieved March 27, 2007. ↑ "Therapeutic Automatism Using the Ouija Board" The Museum of Talking Boards. Retrieved March 27, 2007. ↑ Malachi Martin, Hostage to the Devil: The Possession and Exorcism of Five Americans, (HarperSanFrancisco: 1992 ISBN 006065337X). ↑ Linda Johnson, "Using a Ouija Board" aSkyeWolfe Magickal Pages. Retrieved March 27, 2007. ↑ Latest Works of Fiction: Jap Herron The New York Times, September 9, 1917 [Book Review Section, p. 336]. Retrieved April 13, 2007. ↑ Mini site for J. Edward Cornelious' book, "Aleister Crowley and the Ouija Board" (Feral House, 2004). Retrieved March 27, 2007. ↑ Peter Popham, "The Seance that Came Back to Haunt Romano Prodi" The London Independent (December 2, 2005). Retrieved March 27, 2007. Evangelical Outreach "Dangers of Ouija Boards"
This page was last modified on 8 January 2019, at 21:07.